Hungarian transportation infrastructure has seen an enormous development over the past 10-15 years; the motorway network has significantly increased and main roads and railroads have been developed. These projects also employed new technologies. Monitoring of consolidation by the measurement of settlement or its acceleration by the use of vertical drains is a commonly used method these days. The use of geosynthetic materials has spread in the civil engineering for embankment foundations, in more difficult cases even with additionally built structures. The construction of soil retaining walls reinforced by uniaxial geogrids has become generally accepted by now. 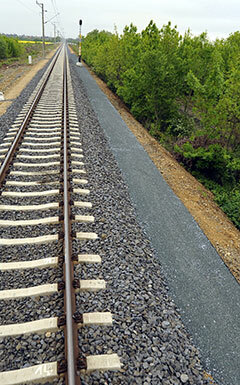 The use of various composite drains serving to protect road structures has gained ground and so has the use of reinforcing grids to prevent reflexion cracking in asphalt layers. Gradex Ltd. has pioneered the introduction of these new technologies and products. We can provide you with turnkey solutions for the solution of your geotechnical problems, from the design to complete implementation. 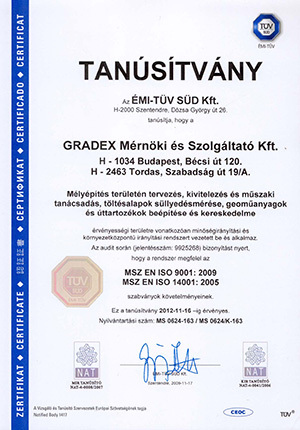 Founded in 1996, Gradex Mérnöki és Szolgáltató Ltd. is owned by two Hungarian civil engineers. The profile of the company at time of foundation featured engineering services, but this has been developed by now into a wide selection of options to our clients in a specialised field of civil engineering. 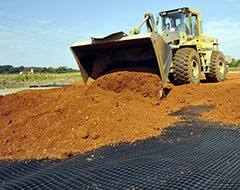 Engineering services now include, in addition to the measurement of settlement, soil mechanical design. We can provide you with turnkey solutions for the solution of your geotechnical problems, from the design to complete implementation. We also represent several recognised international companies that produce high quality products, and we are now manufacturers of two products (asphalt grids, noise barriers). 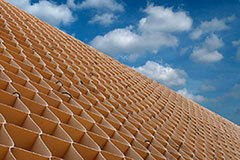 We also install the materials we sell and undertake the completed implementation of engineering structures. In order to develop new solutions and technologies, we have had close cooperation with several universities and also do teaching in our special areas. We would like quality to be considered a primary aspect next to price. Our company represents the classic order of values. We would like quality to be considered a primary aspect next to price. Reliability is a major issue both towards our clients and subcontractors. Our intellectual and financial background created over years serves as a guarantee to our clients for our proper performance. This website presents our products and services and those projects which had been undertaken by us and constructed using our products serving as examples for the solution to problems in several cases. Let us find the best solution together. Our Company is ISO audited since 2000.